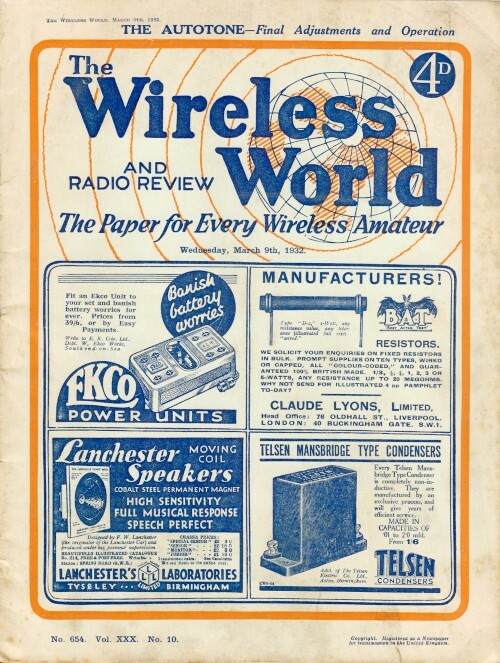 I finally managed to get an early edition of The Wireless World magazine for a reasonable price on a eBay auction. Now I will be able to post a few of those articles from the UK to compliment those from some of the American magazines. This particular edition is from March 9th, 1932. My next target is to get a few from the World War II era which although it began on December 7, 2941 from America's perspective, it officially began on September 1, 1939 for Europe. Warning for the weak of heart - epochal words like "niggardly" and "parsimonious" are used herein, and therefore adult supervision should be employed if ignorance might cause an objection to at least one of the aforementioned. When a receiver is fed with H.T. current from the mains, there is no particular need to be niggardly in the matter of consumption; a few milliamps. here or there make practically no difference to the cost of upkeep. But it is a different matter when dry batteries are employed; in this case, all possible sources of waste should be rigorously avoided, and it may be helpful to enumerate some of the more common causes of excessively high anode current. As often as not, a valve takes more anode current than it should because an insufficient amount of negative bias is applied to its grid. Of course, the same thing happens if the grid is totally unbiased, but then an audible indication that something is wrong is generally given. Further, it is not enough that merely the bias battery itself should be in order, and where there arc grounds for suspicion, it is advisable to test the entire circuit for continuity to make sure that a negative voltage is actually impressed on the grid. A "soft" valve will generally pass a high anode current ; if this defect is not made obvious by the presence of a blue glow around the electrodes of the valve. it may generally be detected fairly easily by short circuiting the grid circuit resistance, and noticing whether this brings about an appreciable change in anode current. If it does, the valve will definitely be "soft." It should be remembered that if there is not already a resistance of sufficiently high value in the grid circuit, this test will not be conclusive, but a resistance may be temporarily inserted. Other faults that may occasionally be responsible for excessive anode current consumption in battery-operated sets are short-circuited anode feed resistances, or leakages. or more or less complete "shorts" in the anode circuits; the bypass condensers may be suspected. Users of D.C. mains supplies are always handicapped by the fact that the H.T. voltage available is inevitably fixed at a considerably lower value than that obtainable from the majority of A.C. rectifiers. This limitation is particularly annoying when one is trying to devise means for supplying a power grid detector with sufficient anode pressure; even if initial difficulties are overcome the detector decoupling must always be designed on almost parsimonious lines. Even if actual "motor-boating" is not present, there is always an uneasy feeling that too much stray L.F. reaction for really good quality is taking place. The final result is that we generally arrive at a compromise ­ something like a "semi-power grid" detector, in which the usual anode circuit limitations may possibly become evident, due to insuffi­cient H.T. voltage. At the best, we can hardly hope to use, as a coup­ling between the detector and suc­ceeding L.F. valve, an arrangement which will produce anything approaching the maximum attain­able magnification. The type of diode detector discussed in The Wireless World of February 3rd suffers from none of these limitations, and, apart from providing almost perfect detection, has the additional advantage that it does not impose any serious damping on the tuned circuit which immediately precedes it. The arrangement, therefore, is one that should be particularly attractive to D.C. mains users, who may accordingly be interested in the skeleton circuit diagram given in Fig. 1. This shows the nucleus of a diode - a L.F. set suitable for high-quality reproduction of local broadcasting, and in which indirectly heated D.C. valves are used throughout. Where greater range is necessary, an H.F. stage may be added in' the usual way. In the suggested circuit diagram a pentode output valve is shown, but, of course, there is. no reason why this should not be replaced by a triode, or where large outputs are required, by a pair of triodes push-pull. A set on these lines, with an H.F. amplifier. is definitely capable of long-distance reception, and there is always the possibility of improved sensitivity by using the diode anode -which in the simpler form of cir­cuit is unemployed-for purposes of reaction in the manner suggested in The Wireless World of June 10th, 1931.